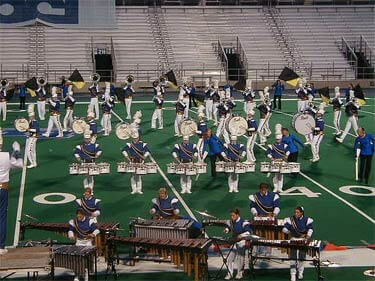 This is a picture of members of the Beatrix tenor line performing their solo in Murfreesboro, Tenn. in 2000. From left to right is me (Kale Bats), Michel Benschop (Mitch), Edwin Tamming, John Hendriks (Honje Ponje) and Bert Strijk. These guys were an excellent group to march with during that summer. Anything was possible for us to do, and we were flying that night. For most of us, it was our first time in the United States performing at DCI shows. We had a blast touring the United States and performing for all those people who came to see us. Thanks guys for a great summer.